The purpose of the conference is to enlarge awareness of the need and appreciation for the benefits of river rehabilitation. It will serve as a platform to present and discuss aspirations, challenges, analytical frameworks and novel approaches to improve our understanding of the causes and consequences of hydromorphological degradation and to enhance river rehabilitation. 40% of European rivers are affected by hydromorphological pressures caused predominantly by hydropower, navigation, agriculture, flood protection and urban development. This conclusion is based on the recent analysis of River Basin Management Plans for the EU Water Framework Directive (WFD). As a consequence, there is increasing emphasis on river restoration driven by demands of the WFD. To improve ecological functioning of rivers and streams EU member states have drafted programmes of measures focusing on restoring river hydrology and morphology. Implementation will require substantial investment in these measures, but there remains a great need to better understand and predict the costs and benefits of future river restoration. Ecological response to hydromorphological restoration, however, is complex and poorly understood. Against this background, REFORM has generated tools for cost-effective restoration of river ecosystems, and for improved monitoring of the biological effects of physical change by investigating natural, degradation and restoration processes in a wide range of river types across Europe. The conference aims to present the major outcome of REFORM mixed with excellent work from other studies from Europe and other continents. Hydromorphological processes operate across space scales from catchment to site and vary through time across all space scales to drive river morphodynamics. We invite contributions on multi-scale approaches to the assessment of hydromorphological condition and the development of sustainable rehabilitation measures. Contributions that link hydromorphology with ecology are also welcome. The majority of rivers and floodplains has been degraded by a multitude of anthropogenic impacts and are among the ecosystems that have seen the largest decline in biodiversity worldwide. Habitat modifications related to substrate extraction, channel re-sectioning, damming, etc., are frequent impacts on rivers that impoverish ecological quality through homogenization of biotopes and loss of connectivity. It is a major challenge to disentangle and quantify the impact of habitat degradation from the multiple stressors that act on riverine ecosystems. We show ways forward and invite contributions on how to assess hydromorphological degradation using existing biomonitoring methods and identify which of the WFD compliant biological quality elements are most sensitive to this type of stress. Worldwide, rivers are being restored to enhance fish habitats, to increase attractiveness and to improve ecosystem services and biodiversity. River restoration is a business worth billions of Dollars/Euros and driven by societal demands and respective legislation. In sharp contrast is the knowledge about restoration effects and factors responsible for success or failure. The majority of measures have not been subjected to monitoring. We will present our review of published studies on river restoration effects and our extensive field studies on how different restoration measures affect hydromorphology, river and floodplain biota and functions and invite contributions demonstrating restoration achievements. IV. How to improve the (cost-)effectiveness of river rehabilitation? River restoration is expected to deliver a multitude of ecosystem services and societal benefits. Many of these benefits can be characterized as public goods, which makes it difficult to quantify them in economic terms for comparison with the costs of river restoration. River restoration can be costly and it is therefore paramount to identify the least cost way to improve their ecological status as required by the Water Framework Directive, and simultaneously maximize the broader benefits associated with habitat and ecosystem rehabilitation. Possible trade-offs with other sectoral interests, for example navigation and hydropower, are ideally accounted for, as well as the causal link between restoration efforts, biophysical effects, ecosystem services and socio-economic benefits based on integrated hydro-ecological-economic modeling. Conceptual and applied case study contributions addressing these key methodological issues are invited. It is recognised that there is considerable conflict between river rehabilitation objectives and those of other water sector drivers, such as flood prevention, hydropower, navigation and agriculture. However, there are equally substantial benefits and synergies that can be gained if the various sectors work together to achieve sustainable outcomes that improve the ecological status of rivers. This section is looking for case studies, policy frameworks and guidance to promote synergies between sectors to facilitate sustainable rehabilitation activities in multiple user environments. Translating scientific knowledge into guidance for river restoration practitioners presents a major challenge. We invite contributions on practical tools to assess river status and guide rehabilitation to optimize river basin management. More generally, we welcome contributions on best practices of using scientific knowledge in river restoration projects. The summer school (Saturday 27 June - Monday 29 June) addressing students and young researchers took place before the final conference. The 3-day programme encompassed field visits to stream restoration projects, theory for assessing degradation and plan restoration and drafting a restoration strategy. 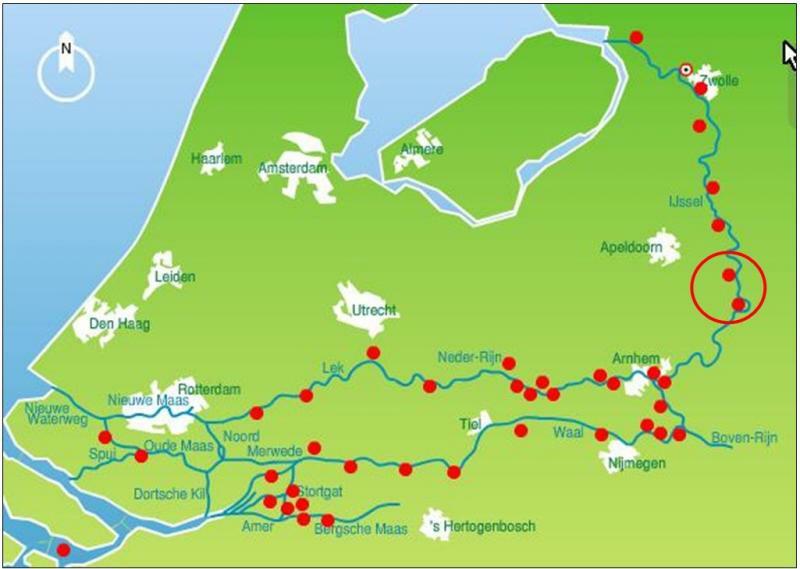 The excursion (Thursday 2 July) visited ‘Room for the River’ where projects are realized to serve flood protection, ecological rehabilitation, navigation and urban developments. 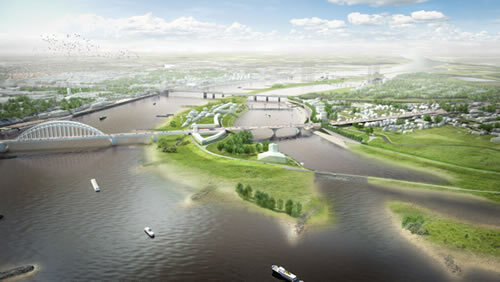 One location 'Room for the River Waal' is a dike relocation project near the city of Nijmegen where urban development and flood protection are the primary goals. The other location is the floodplain nature reserve 'Millingerwaard' where ecological restoration and flood protection go hand-in-hand. The excursion ends with a 2.5 hr boat trip on the River Rhine with a pancake dinner.